And because of my tweets and because of my email, Amy from Rue La La contacted me by Twitter, email, and voice mail to set things right. They credited my account $20 - which is pretty cool. So while I'm still a little upset over the loss, at least - after some whining on my end - Rue La La made amends. 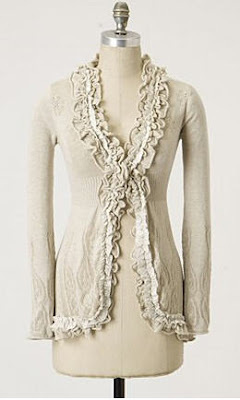 So I bought this lovely ivory cardigan from Anthro - and I can't wait to get it! It has stellar reviews, and I can see myself wearing this with just about any dress I own, paired with some adorable boots, this Fall. How was everyone's weekend? I'm hoping for a productive week this week, followed by a lazy, beach bum weekend. Oh yeah... and happy 08/09/10....does anyone else feel like this year is flying by? I need a pause button please, thank you. That sweater is stunning! We have very similar taste in our Anthropologie loves ;) And hooray for your $20 credit. That really makes me think very highly of Rue La La. Congrats on the great score! That sweater is presh.